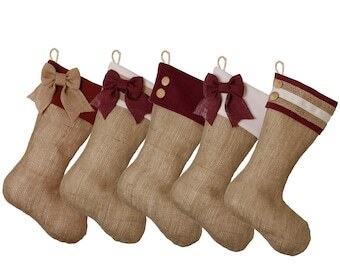 Christmas Stockings for Family - Set of Five (5) - Taupe Springs Eternal! Announcement October 14th - Working away at personalization in the shop today. This is the best time to ask for embroidery or embroidered stocking tags, as there are several weeks left before the decorating window. October 14th - Working away at personalization in the shop today. This is the best time to ask for embroidery or embroidered stocking tags, as there are several weeks left before the decorating window. 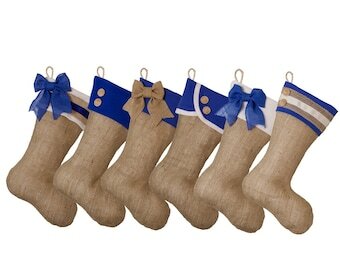 Christmas Stockings for Family - Set of Three (3) - Taupe Springs Eternal! Very well made and match my "human" family stockings so well!!! Prompt delivery and very easy to work with. So happy with these! Super cute stocking! Our dog is like a member of the family so this was a must. Small so it doesn’t fit a lot of stuff, but that’s fine because we had presents for her too! Some freshly finished stocking tags for furry members of the family. Stacked Madison stockings in my shop. I try to get ahead of the Holiday rush by building some inventory in the summer. The rotary. When cutting single layer fabric, this is my tool of choice. An adhoc extension of the main work bench. It's a plastic fold-out so I don't have to worry about glue or heat. A photographic relic from when I made custom wedding hangers. I still do on occasion, but only for friends and fam. As a teacher in San Diego, I am no stranger to the "pink slip" game. For several years in a row, every year, my local district had to layoff hundreds of teachers in an attempt to balance their budget. Many teachers were hired back almost as quickly as they were let go. In 2011, I was ten years into this very stressful emotional pendulum, getting somewhat used to it when my husband and I discovered I was pregnant. Now, about to begin motherhood unemployed and uninsured, things were getting real, fast. It was panic time; there's a baby on the way! I knew, for me, there was no better way to feel better than shopping. No sooner did I walk into a home decor shop, when I spotted a burlap covered pillow. My unemployed-self saw that $100 price tag and said "Pshhh, I can do that"...and BurlapBabe was born! Pink slips were recalled three days after my retail therapy epihany, and the sweet little baby that prompted it all was born not too long after. Thankfully(? ), she'll never know a world without burlap. Fast forward six years later and my husband and I work evenings and weekends (mostly when our kids are asleep), out in our garage. Tired, together, and happy. My moral of the story is: no matter what the challenge, there is nothing a glue gun and a great pair of scissors can't fix. As the saying goes, I am a jack of all trades and master of none. Many of those trades have been web and business related, so when it came time to put some of wife's beautiful products online, I was ecstatic to contribute and work together. Much of what BurlapBabe does is personalized and custom work. Each customized or personalized order can have its own specific processing and shipping time. Estimated timelines are usually established in "Convos" prior to purchase, and then included in the product listing itself. Custom and personalized orders cannot be returned. Exchanges are dealt with on a case-by-case basis. Please contact me for wholesale availability. Prices will vary based on quantity and delivery time. We participate in Etsy's Wholesale division. If you are looking for something tailored to your business, or have a specific set of needs we also have our own wholesale program which you can get more information about by emailing us.